Doing In With a Bang is an easy way to get this achievement. 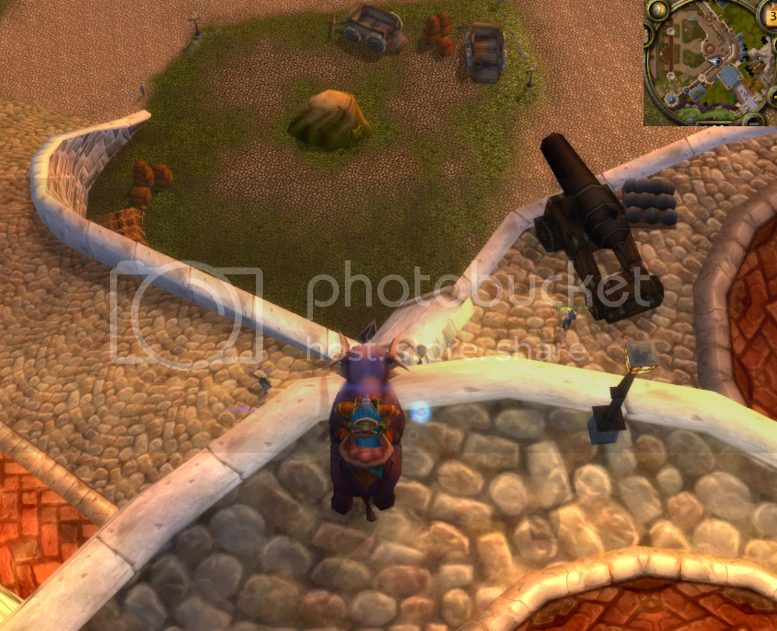 If you're a Worgen you can get this in the starting area during Two if by Sea Two By Sea by aiming the catapult in the highest arc you can. I got the this achievement while going for Ghost in the dark Ghosts in the Dark . 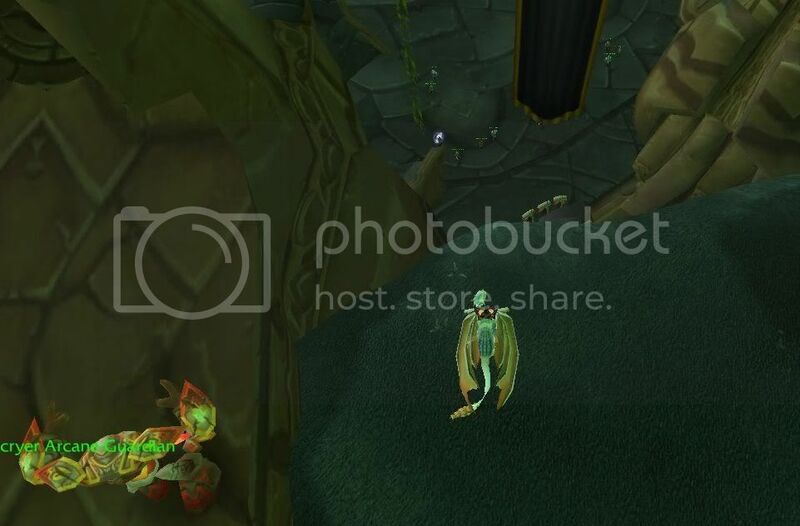 I jumped in to the Maw of the Void in Darkshore from the highest point and got Going Down. Get yourself to gadgetzan - pickup Rocket Rescue , once you complete it use the 'rocket to return to gadgetzan' and bingo! Insta-achievement! You can get this achievement by completing the Northern Barrens Sampholange quest chain through the quest: Wenikee Boltbucket which teleports you. Going Down? Im most proud of this one :) Hard to guess fall damage. Completing the Molten Front daily Into the Fire will award this achievement. 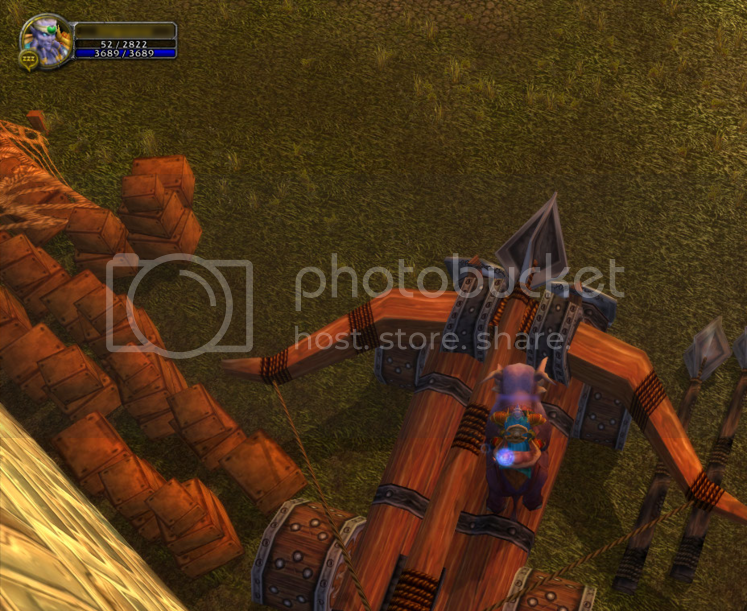 (Goblin) Launching yourself on the rocket for the quest Up, Up & Away! also will award this achievement. FYI, I got this achievement doing the Druids of the Talon quest Into the Fire when it dropped me into the pit. Starting night elves can get this by jumping from high on Aldrassil while Wind's Embrace is active from the Teldrassil: Passing Awareness quest. This can be done by any class easily with no chance of death. In twilight highlands during the quest The Maw of Iso'rath (the quest where you fly on a gryphon around the swinging tentacles and you get knocked off and eaten). Falling into the Maw gives you credit when you land. 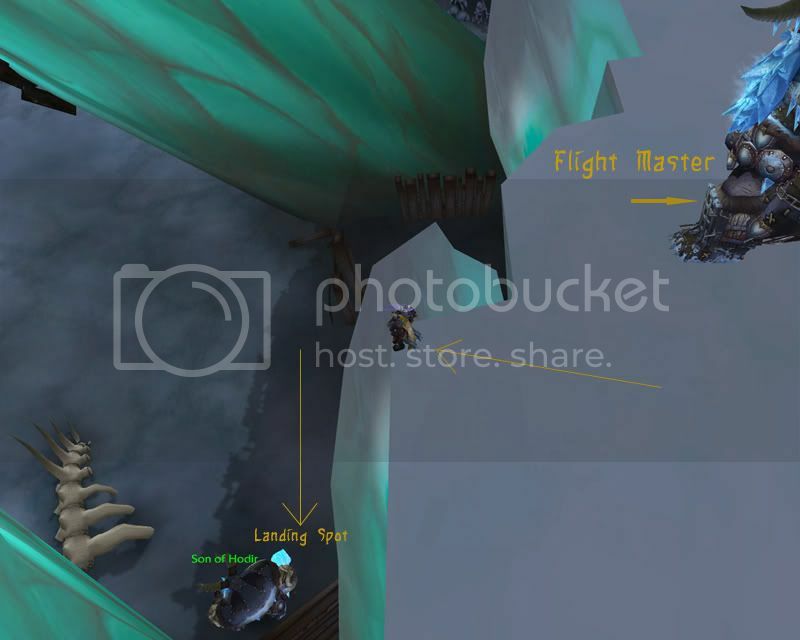 ALLIANCE: Go to the Maw of the Void (the big swirly whirlpool in the upper half of Darkshore, just south of Lor'danel), and jump into the whirlpool. Little cinematic of you being swept away, you land in a cavern, take no damage, and BANG achievement. While you're there, go up the little ramp and kill Telarius Voidstrider, grab Writings of the Dark Herald that he drops to start Writings of the Void, go turn it in and BAM, another achievement: Ghosts in the Dark. I managed this achievement whilst doing the Bring Me The Egg! 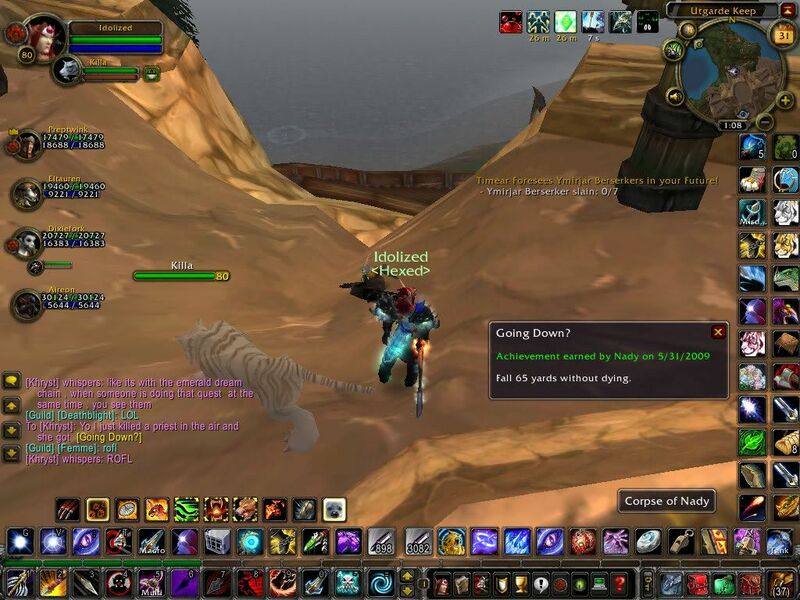 quest in Nagrand. Instead jumping forward toward the nest I somehow went backwards and when I landed got the achievement! if ya dont know, the Shadowstep falling trick, is to target a enemy in the ground and shadowstep to him the moment ya can! i have done it to save myself from falls that are like 3 times the dead level XD i once fell from on of the top plataforms borean tundra and saved my life with this! One easy way to get this is to do The Maw of Madness in Twillight Highlands. Since a recent patch (4.3?) it seems slowfall buffs do not disqualify a character from getting this achievement. Both the engineering Flexweave Underlay (after an accidental midflight dismount) and the priest Levitate (jumping towards the Darkmoon Fair) gave me the achievement upon landing (on two different characters obviously). Go to the swamp of sorrows and accept the quest In With a Bang (prereq quests are Kill Gil and Can't Take It With Them ) from Crazy Larry. After that talk to the Lil' Crazy Jerry who is outside the little camp. He will load you into a cannon where you get the achievement. The easiest and simplest way to do this on Alliance now, is to complete the quest chain for The Fall of Ga'trul. Once you kill Ga'Trul, take the plane that they provide outside of his chambers to get back to Paw'don Village. During that trip, you will actually be shot down and your plane will be destroyed. But you'll float down the rest of the way with a parachute, and complete this achievement once you touch down in the village. If you have Miss Fanny launch you as hard as she can, after completing the related quest line, you will land safely in the mud puddle with the pigs on Thunderfoot Ranch and get this achievement! Got this achievement while completing The Fabulous Miss Fanny. After launching the turnip, watermelon, and tofu, have fanny launch you as well. Don't think it matters how hard he hits you. And no fall damage to worry about. I just got this, unexpectedly, in Azuremist Isle. While doing Totem of Tikti, you get a buff called Ghost Walk. Jump off the cliff and float down to the ground, achievement received! Doing quest The Fabulous Miss Fanny will grant you this achievement. You can complete this achievement using Avalanche Elixir. Doing the Horde version of Rocket Rescue will also give you Going Down? I imagine doing the Alliance version Rocket Rescue will do the same.